Jim Burke-Daly aged 100 on his tractor. 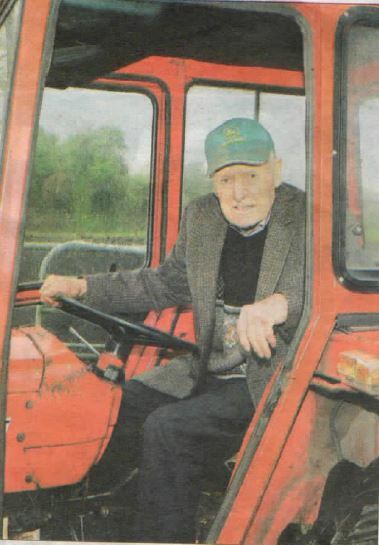 One of Milltown’s best known residents and one of Co. Galway’s oldest people, Jim Burke-Daly from Banagher, died last week in his 102nd year. Jim made local and national headlines during April 2016 when he raised the tricolour at a ceremony to mark the 1916 Rising in his native Kilconly. He was the oldest person in Ireland to do so, having been born three months before the Easter Rising. He was interviewed by RTE’s Pat McGrath for the main evening TV news about his memories as a child of the War of Independence in the Kilconly area. A familiar figure on the roads around Milltown, driving his tractor up to a few days before he died, Jim was also a keen cyclist and dancer who, along with his daughter Noreen in his latter years, was a regular visitor to the annual music festival in Lisdoonvarna, Co. Clare. Jim had been planning to make his annual trip to the event again this autumn. A native of Ironpool, Kilconly, Jim worked at many jobs during a very active lifetime including farming, sawmilling working with Galway Co Council and with Tuam Sugar Factory. A keen gardener, Jim was also noted for the quality and the quantity of blackcurrants that he grew and harvested annually for the Cheever’s jam manufacturing company. One of the photographs on display in Tuam Cathedral during his funeral Mass was of Jim holding a container of his prize-winning blackcurrants. Chief celebrant at the Mass Fr Sean Flynn and Jim’s son Sean both spoke about his long and active life, how he never feared hard work and his love for traditional Irish music and song. He was predeceased by his wife Una and daughter Mary and is survived by his son Sean, daughters Noreen, Eileen and Teresa, his brother Tony, grandchildren and great-grandchildren. After his funeral Mass in Tuam Cathedral on Saturday Jim Burke-Daly was laid to rest in Kilgevrin Cemetery. This page was added on 02/10/2017.